Luis Garcia Berlanga,19-21, 46023 Valencia, Spanje. 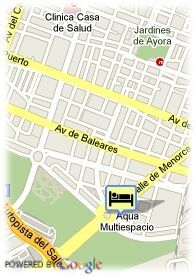 Hotel located in front of Valencia´s Ciudad de las Artes y las Ciencias. Built in 2006, the hotel belongs to the Aqua Center Shopping Resort. 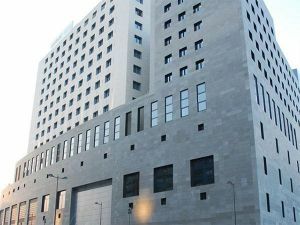 This meticulously designed hotel is placed in front of the Art and Sciences Museum, right beside the old Turia´s riverbed. Within an area which is developing and becoming an attractive tourist and business area. Among the hotel facilities, the panoramic bar and restaurant and the gym stand out. In the same building there is a varied leisure offer, including a shopping mall, a multi-screen cinema and a bowling alley. The hotel´s four meeting rooms, with capacity for 165 people, are ideal for any kind of event, whether it is a social reunion or a business meeting. The airport is at just 15 minutes by car, while the train station is at 3 Km. El Saler business centre is at just 1,5 Km.